Biometrics — how can science better use behavioral and physical traits to more effectively identify individuals? Head mounted displays — giving the soldier in the field real-time tactical information, but how much information is too much? These are two of the research areas at N.C. A&T in the field of homeland security and national defense. 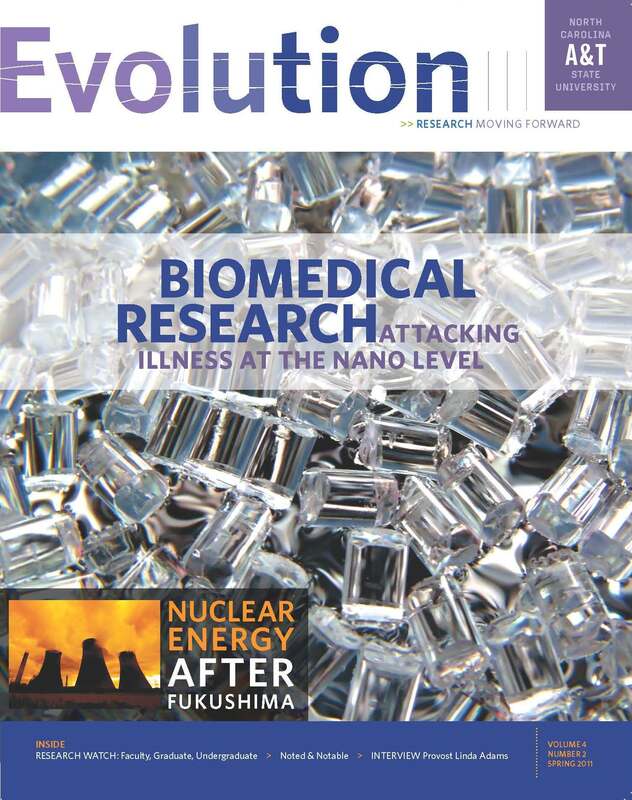 The fall edition of Evolution, A&T’s research magazine, features reports on these projects, along with articles on brain tumor research, teaching green building practices to produce sustainable careers, and creating a new program in food defense and protection. The new issue also contains a report on A&T’s remarkable success in producing female engineering graduates and the remarkable female faculty members who inspire them. Changing social demographics, parental guidance, strong mentors and a supportive environment are coming together to change the face of engineering at A&T. Evolution is distributed electronically on campus. The print edition of the magazine is distributed primarily off campus. The redesigned website for the Division of Research and Economic Development, coming in late January, will include a new online format for the magazine. 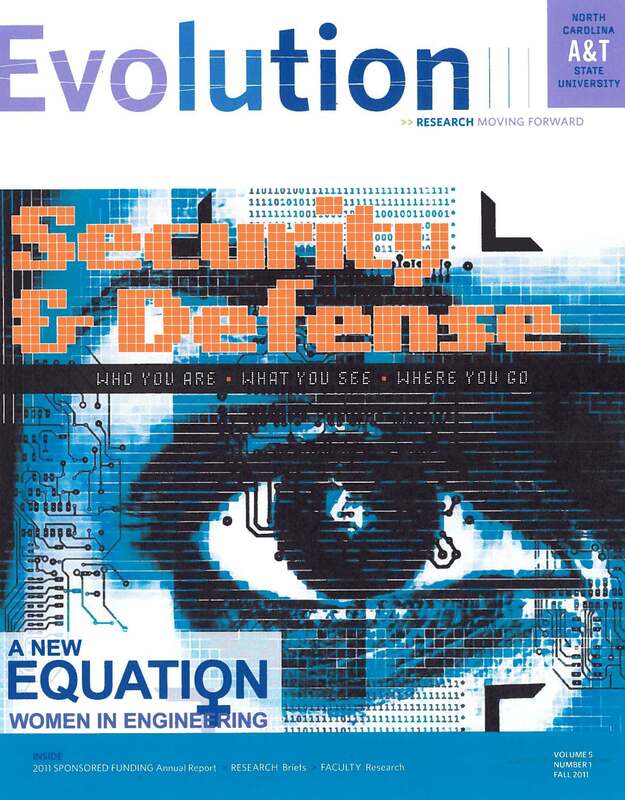 The Spring 2011 issue of Evolution, North Carolina A&T’s research magazine, is now available online. Research projects being conducted by five faculty members and two students. This issue also features a short column by Dr. Celestine Ntuen, published in a longer version immediately below this item with a request for you to share your thoughts on Dr. Ntuen’s ideas regarding emergence and convergence. Evolution is now available on campus exclusively in its online edition, available on the Aggie Research blog and the Division of Research and Economic Development website. A limited number of printed copies are distributed off campus and to on-campus offices and individuals as needed. A shorter version of this column by Dr. Celestine Ntuen, interim vice chancellor for research and economic development, appears in the Spring 2011 edition of Evolution, North Carolina A&T’s research magazine. Emergence is a phenomenon that results from interactions of many behaviors. In studies of complex systems, emergence is what happens when new ideas or entities appear. It represents unpredictable, stochastic circumstances – the “aha” moment in a laboratory. Convergence is the interaction of interdisciplinary and transdisciplinary sciences and technologies toward solving a common problem. Paradigm shifts driven by concepts in emergence properties and convergence in technology are about to invalidate the status quo in scientific inquiry. For example, funding agencies are moving away from funding single investigators to more collaborative teams – interdisciplinary and cross-disciplinary scientists converging to address a common problem. These are the opportunities for which our existing and emerging research clusters were designed. The biomedical research described in this issue of Evolution is a good example. The concepts and technologies of emergence and convergence have much to offer North Carolina A&T State University. First, we are developing the structure and capacity to do research seamlessly, anywhere, anytime with cloud computing. Cloud computing is a model for enabling convenient, on-demand network access to a shared pool of configurable computing resources (e.g., networks, servers, storage, applications, and services) that can be rapidly provisioned and released with minimal management effort or service provider interaction. Biomedical and health sciences; biomedical computing and health informatics; nanobioscience & nanoengineering; agromedicine Solutions for Alzheimer’s disease and cerebral-vascular disease among African Americans; nanotechnology in drug delivery and tissue engineering / regenerative medicine; agroproducts, like medicinal mushrooms, and post-harvest technologies; microelectromechanical (MEMS) systems for healthcare. Identify sciences Language and biological sciences, computing sciences and engineering. At A&T, emergence and convergence are more than simply bringing faculty and student scientists together; they are about solving targeted problems of value to humanity. We have emerging research clusters, such as Bioscience and Health, as well as Social and Behavioral Sciences, and soon we will target Nutrition and Food Sciences. These clusters are fractional emergences resulting from interest among groups of faculty members. How do you get people to converge? The answer is simply: Get people’s ideas to converge. Physical presence is no longer relevant. What is the major contribution of convergence and emergence in academic programs? The answers are many. In my view, departments and schools should be designed to facilitate interdisciplinary ventures and cross-fertilization of intellects. Academic programs can be restructured to be flexible, adaptive and responsive to changing knowledge-based and networked systems globally. What are other benefits? Global access to innovative technologies, distal collaboration for research and education, and sharing global problems contextually. I urge our faculty and students to think about emergence and convergence and be ready to embrace the changing dynamics of research and funding policies. What do you think? Please add your comments – I would be delighted to hear your reaction to my thoughts.